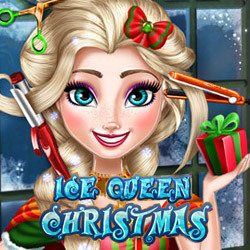 Description: This year The Ice Queen is celebrating Christmas by getting a new haircut! Get inside one of the most professional hair salon's in Arendelle and start the queen`s transformation for the holidays. Comb, trim or straighten her beautiful blonde hair in any style you desire. You can even dye it in fun colors and give it your own twist! Add a dash of glitter with funky accessories and she will be ready for Christmas!